Bry-Air (Asia) has taken one more step ahead in strengthening our partnership with Pharma industry. 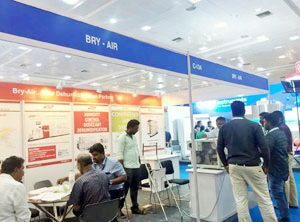 Bry-Air participated in PharmaTech Expo 2018 at Chandigarh on 27-29 April, 2018. 7th Edition of PharmaTech Expo 2018 & LabTech Expo 2018 was delighted to enhance business opportunities in North India with focus on Pharma Machinery, Lab, Analytical, Pharma Formulations, Neutraceutical, Ayurvedic Formulations & Packaging Equipment. In this expo, Bry-Air (Asia) with its Co-exhibitor company “Descant Rotor International” displayed the “Arctic Cooler” & also interact with Suppliers, Manufacturers, Industrialists, Entrepreneurs, Buyers and Consultants. A special “Buyer-Seller Meet” segment was also conducted during the show which provides the platform to meet with the African Buyers & understand their requirements. Bry-Air Airgineers were seen actively engaging several contractors, consultants and end users visiting our booth for understanding and getting quick solutions for their humidity and moisture control needs.